Like most European cities, Florence's city centre has several markets, some are more focused on food, others on fashion and some even have a weekly or monthly flea market. For example, when visiting Frankfurt, we always try to make sure we are there for their Saturday flea market along the Main River, as it is a great place to shop and people watch. In Florence, you have your choice of several different markets depending on the day of the week. Mercato Centrale is both and open air and indoor market. The open air area is full of vendors selling everything from socks to trinkets and like most Florence markets a plethora of leather goods. The ornate two-story Mercato Centrale building was built in 1874, after the Mercato Vecchio was demolished to make way for the Piazza della Repubblicaa few blocks away. Here you find lots of permanent vendors as well as upscale touristy restaurants and shops. For those of you familar with Vancouver's Granville Island Market, or Seattle's Pike market there are many similarities. Piazza Ghilberti Market (food and clothing) is also open everyday and given its location on the east side of the City Centre you get to mix a bit more with the locals than the Mercanto Centrale. It too has an outside stall area that is very animated and an indoor space. Best to get there early, as it can get quite crowded later in the morning and most of the action is pretty much over by noon or 1 pm. On your way to the Ghilberti Market you might want to stop by the small antique market on the Piazza del Ciompi which operates from Monday to Saturday opening about 10 am the best we can tell. Seems like the vendors open whenever they like. The entire piazza looks a bit ramshackled, but there is a good selection of second-hand stores to explore. The Flower Market takes place on Thursday morning under the colonnade of the Palace at the Piazza della Republic. It is not a very large market, probably only a 15 to 20 minute "look see" for most people so combine it with some other activities that day. It is very colourful and refreshing as Florence's City Centre has very little vegetation. 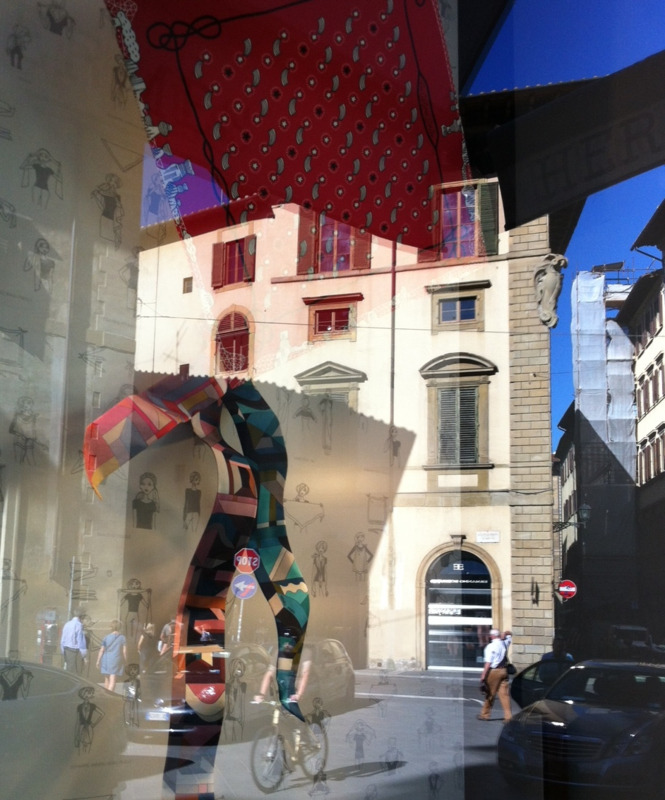 On the third sunday of the month at the Piazza Santo Spirito is a craft and food market. The crafts are very limited, but there are a few things you won't see at other markets, like the lady hand-weaving baskets or the hippy guy making hand-made shoes. We were told this is where the local foodies shop. The third weekend of the month there is also an antique market at the Fortezza de Basso / garden. Unfortunately, we didn't get there so can't comment on the quality of the experience. Every Tuesday from 7 am to 2 pm you will find the mother of all flea markets in Florence's Le Cascine Park along the Arno River. It is a linear market that goes for over 3 kilometres with vendors on both sides. It took us almost two hours to do one side and we weren't looking at everything. While some vendors might stay there until 2 pm, we saw some beginning to pack up just after noon. There are a few food vendors, but it is most clothing vendors - not designer knockoffs, but rather mostly new cheap clothing, shoes, accessories, and kitchen products. This is not a "made in Italy" fashionista experience and not a place for vintage treasure hunters. That being said there were some treasures to be had if you were prepared to dig in the pile of scarfs. Brenda did manage to find two vintage scarves for 1 euro each and a modern Italian made sweater/coat for 40 euros. It was a great walk in the park, a chance to mingle with the locals and people watching. What more could you ask for? The east entrance to the Le Cascine Park Flea Market is marked by this tear drop road marking. It was a drizzly day when we arrived, but the rain soon stopped and it was a very pleasant walk along the tree-lined market. The linear market was easy to negotiate as you just go up one side and dow the other. Brenda checking out the racks of clothing. I am looking for something for my sweet tooth. Brenda had her eye on this cool dude for awhile. Yes that is his bike. Brenda spotted with pile of scarves and she was on it like a dog on a bone. 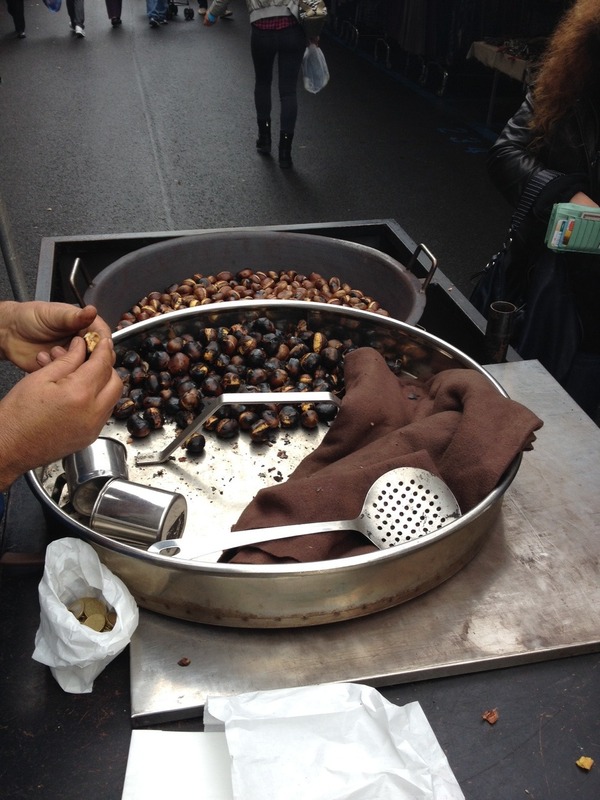 What's a flea market without The roasted chestnuts to enjoy. The Bead Lady was doing a brisk business. Inside the butcher was fun to watch. We loved the fact that people of all ages were enjoying the market. Don't be put off by the appearance of the shops there are some treasures to be had. This piazza dates back to 1252 when Augustinian monks built a monastery and church. Today it is a bohemian hang-out with restaurants, cafes and a market. We awarded this vendor the top prize for visual presentation. These bronze fragments are a war memorial. German soldiers at the end of WWII conducting public killing of freedom fighters and political opponents in the piazza and streets surrounding it. The indoor market is more like a food court in a mall or office building than a farmers' market. Looking down from the second floor restaurant you get a better sense that this isn't your quaint local farmer's market. The flower market has one of the prettiest spaces of any market I have ever seen. Florence's flower market adds a burst of colour and plant life that is absent from most of the City Centre. One of the things all of Florence's markets have in common is that they are enjoyed by everyone from young children to seniors. More and more urban planners and designers are cognizant of the 8/80 rule that states; if a place or space is attractive to kids 8 and younger, as well as 80 and older, it will be attractive to everyone in between. While exploring the markets and streets of Florence, I have seen more seniors hobbling with canes along the busy and bumpy streets, sidewalks and piazzas than I have seen anywhere else in the world. Kudos to them...I don't know how they do it. Why Mr. Potato Head Loves Blackfoot, Idaho? As Winter Olympic host cities Calgary (1988) and Salt Lake City (2002) share much in common. Both cities are young (Calgary’s median age is 36 while Salt Lake City’s (SLC) is 30), both have a population base of just over one million people, both are gateways to mountain recreational playgrounds and both have signature international festivals (Stampede vs Sundance Film Festival). At the same time, the DNA of each city is very different. Calgary is defined by its corporate oil & gas headquarters culture, while SLC is defined by its Mormon culture. For a long time I have been intrigued by the idea of how the two cities would fare in a competition of urban living amenities. Who would win the gold medal for the best public space, shopping, attractions, urban villages, transit, public art etc.? This spring on our 8,907 km road trip stayed in SLC for six days to check it out. While SLC’s Salt Palace (convention centre) opened back in 1996, it still looks very contemporary with its extensive use of glass and steel. It features a dramatic entrance with 110-foot transparent beacon towers. Inside, the uplifting drama continues with bright and airy public areas with a lofty ceiling that features specially designed trusses by renowned roller coaster designer Kent Seko. Nobody would call Calgary’s Telus Convention Centre a palace. And with only a third of the exhibition and meeting space of SLC’s Salt Palace, and architecture that is less than inspiring, Calgary is the loser here. Aerial view of SLC Convention Centre in the heart of their downtown. SLC’s Central Library, designed by Canadian architect Moshe Safdie, opened in 2003 at a cost of $84 million ($127 million in 2014 dollars). It is a five storey triangular building with a sweeping signature curved wall that shares much in common with Vancouver’s Centre Library, also designed by Safdie. Its rooftop garden offers great views of the city and the mountains. The Library, along with its neighbour the Leonardo Museum (the old library building has been converted into a fun and funky hands-on science discovery centre) has become a meeting place for people of all ages and backgrounds. It will be interesting to see if Calgary’s new Central Library can be as successful in capturing both the public and the design community’s attention. With a budget of $245 million, I sure hope so. Who knows what will happen with our old library – maybe an Energy Museum? SLC's dramatic downtown library and public plaza. Rendering for Calgary's new downtown library. A gold medal has to be awarded to SLC for its Utah Museum of Contemporary Art which is part of the 1979 Bicentennial Art Complex. Admission is free with a suggested donation of $5, making it very accessible. 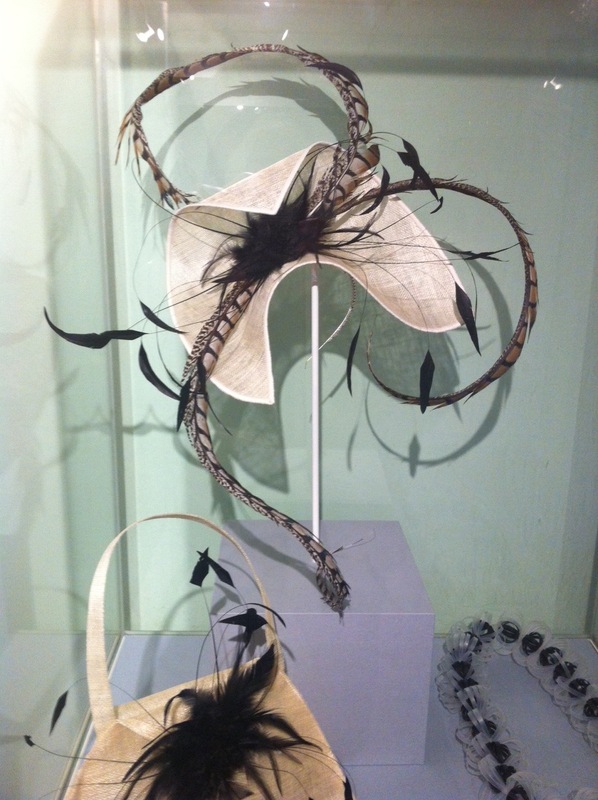 Though not a large gallery, the exhibitions we saw were imaginative and engaging. It also doesn’t have a long history (established in 1931); it wasn’t until 1979 that it moved to its current downtown location from the Art Barn near the University of Utah. Over the same period, Calgary has struggled to find a home for a contemporary art gallery. Let’s hope that Contemporary Calgary will be successful in its vision of converting the old Science Centre into a vibrant civic art gallery. The Utah Museum of Contemporary Art is part of a major arts complex. Calgary's EPCOR Centre would be on par with SLC complex except for the art gallery component. SLC also takes the gold medal for the Temple Square campus, headquarters for the Church of Jesus Christ of the Latter-Day Saints. The multi-block Campus is home to not only the Temple, but to the original church, an office headquarters, the Tabernacle (housing a 11,623 pipe organ) home of the Tabernacle Choir and the historic Lion and Beehive house. Just north of the Square is their library, the magnificent LDS Conference Centre with its 21,200 seats and the Family History Museum, the largest genealogical library in the world. The campus is sea of peace, inspiration, beauty and tranquility in the middle of the city, a rarity in this day and age. The closest thing Calgary has to match Temple Square is Stampede Park our city’s homage to our culture of ranching and agriculture. The BMO Roundup Centre, Saddledome (SLC has a downtown arena on par with Saddledome), Grandstand, Agrium Western Event Centre and Corral are no match for the architecture and atmosphere of Temple Square. This might change however when the Stampede completes its expansion and enhancement plans. The Temple is the centre piece of a multi-block campus of LDS buildings that is their corporate headquarters. LDS Conference Centre with its roof-top garden/plaza and 21,200 theatre seats is a hidden gem on the hill behind the main campus. Calgary wins the gold for public spaces. SLC has nothing to match our amazing collection of parks, plazas and promenades – Olympic Plaza, Devonian Gardens, Stephen Avenue Walk, Prince’s Island, Riley Park, Fort Calgary Park, Central Memorial Park, East Village RiverWalk, Shaw Millennium Skate Park and Bow River pathway. A bocci ball match breaks out in the Hotchkiss Gardens as noon hour in downtown Calgary. (Photo credit: Jeff Trost). Downtown employees enjoy some sun and people watching along the Bow River Promenade and Prince's Island park. Other workers enjoy a run or walk at noon hour across the Peace Bridge designed by Santiago Calatrava. When it comes to urban villages, SLC has nothing to match the urban vitality of Calgary’s Beltline, Bridgeland, Kensington, Inglewood, Mission and 17th Avenue with their contiguous mix of shops, cafes, restaurants and music venues. Dairy Lane has anchored West Hillhurst's Main Street for over 50 years. Calgary's 17th Avenue aka Red Mile is a vibrant street with its mix of shops, restaurants, patios, pubs and lounges. We did find one street (Broadway) with some pedestrian oriented shops in SLC. Loved the mid-century modern shops, our favourite was The Green Ant. Calgary also wins gold for its Central Business District that combines not only its 35 million square feet of office space (with another 5 million under construction), but also how its offices, hotel, retail, cultural and historic districts are linked both at street level and with the world’s most extensive elevated walkway - +15. Norman Foster's Bow office tower viewed from Olympic Plaza. Calgary's skyline is dominated by highrise office and condo towers. Calgary also wins gold for its plethora of new condos and new infill single family and duplex homes near its downtown. While SLC has some new condo and infill housing development it is nowhere near the scale of what is happening in Calgary’s inner city communities. The more I visit cities like Portland, Denver and SLC, the better appreciation I have for the incredible inner city revitalization happening in Calgary. Alura a new apartment across from the new Barb Scott Park with its Chinook Arc artwork. Four new high-rise condos line Macleod Trail next to Stampede Park. Waterfront project consists of five buildings with 1,000 condo units. When it comes to indoor shopping centres, SLC City Creek (yes, it does have creek running through it, and even a retractable roof) and Calgary’s Core are on par with each other, with its massive three-block skylight and Devonian Gardens. The same could be said for the LRT systems. Although Calgary’s system carries a lot more passengers, SLC has a bigger and better free fare zone (buses are also free in their downtown). The two cities are also tied when it comes to their respective downtown arena, performing arts centres, ballet and theatre groups. Like Calgary, SLC also has both a Zoo and a heritage park located just a few kilometers from the downtown. Harmon's grocery store in downtown SLC. SLC's City Creek shopping centre does indeed have a creek running through it that meanders back outside. The Core shopping Centre links three city blocks with its massive skylight. SLC's capitol building sits on a hill with a magnificent view of the Salt Lake valley and mountains. Eight Avenue Place is just one of dozens of office towers that dominate Calgary's downtown sense of place as a major corporate headquarters centre. For those snowbirds who drive down to Phoenix and Palm Springs to escape our winter, it would be well worth your time to plan a few days to explore SLC. We highly recommend the free personal tour of Temple Square campus conducted by young missionaries. We got a wonderful insight into the Latter-Day Saints culture with no pressure to discuss our religious beliefs. The LDS Church earns more than $7 billion a year in tithing and other donations. In 1996, Time magazine estimated the church’s assets exceeded $70 billion (banks, radio stations, Utah’s largest newspaper, farmland, and Brigham Young University). In fact, the Church built and owns the $2 billion City Creek Center shopping mall in SLC along with many of the office towers across from Temple Square. The LDS Church is a unique corporation that creates a unique sense of place in downtown SLC, as does the oil and gas towers in Calgary. It is interesting to note there are more suits and ties in SLC than in YYC. We'd highly recommend checking out Em's (271 North Centre Street, near the Capitol Building). We liked it so much we went two nights in a row and almost went a third night. I loved the marinated pork chop in a maple mustard and bacon barbeque sauce ($19) and the housemade ricotta gnocchi tossed in basil pesto($9) and Brenda loved Potato Lasagna ($17) one night and the dried fruit stuffed Pork Tenderloin with roasted potatoes in a bacon sherry vinaigrette ($26). Don't get me started on the desserts. Bread pudding with homemade ice cream. Our choice was the downtown Red Lion Hotel and we weren't disappointed. Just off the interstate so easy access and yet still short walking distance to all of the downtown attractions, even a indie cafe across the street. The hotel has been recently renovated so everything was nice and new. Great view of the Wasatch Mountain out the window of our Red Lion Hotel in downtown Salt Lake City. Comfy bed with the best hotel reading light we have found. Calgary vs Denver: A tale of two thriving downtowns! An edited version of this blog appeared in the Calgary Herald's New Condos section on Saturday, September 27, with the title "Salk Lake City has Gold Medal amenities, but Calgary has Gold Medal public spaces and public art." Why is it that we wait until we have visiting family and friends to check out our local museums? I have been hearing great things about Calgary’s Military Museums for years. I drive by often and worked for five years almost across the street from it, yet I have never been in. A few years ago when a history-loving nephew was visiting, I dropped him off and went to work, rather than joining him to tour the museum. Shame on me! With my Mom visiting, we thought it would be an interesting activity for a Sunday afternoon. In fact last Sunday, we checked out the exhibitions at the Glenbow Museum, another place that I don’t make time to visit often enough. In addition, there is also the Founder’s Gallery and a theatre space, all located in a decommissioned school with major addition. Though not a signature building designed by a famous architect the building is more than adequate as a museum space. And quite refreshing to see how modestly repurposed building can become a major public attraction without spending 100s of millions of dollars. The entrance to The Military Museums is subtle in design and statement. Once inside the museum your attention is immediately captured by a large mural that consists of 240 separate images. Each image tells a story that you can read at the video terminal. I enjoyed the many personal quotes that captured the various wartime experiences. It is good to be reminded that only 100 years ago Canada was a much different place psychologically. The exhibitions are very text-based, well researched with lots of very interesting stories and factoids. There are excellent supporting artifacts, visuals and displays. If you read all of the text and watch all of the videos, I expect you could be there all day. There is a mind-boggling amount of information to read and absorb. The one thing that seemed to be lacking were “hands-on” experiences for kids. Where was the opportunity to dress up like a soldier? Perhaps a chance to walk in a military trench with loud noises of simulated gunfire, bombs etc. What kid wouldn’t want to climb up onto one of the planes or amoured vehicles in the Naval Museum of Alberta? A lesson could be taken from the Calgary Stampede where kids climbing on the Canadian Armed Forces vehicles on display is a very popular activity. There are numerous displays depicting life on the battlefield. The collection of medals is impressive. The Naval Museum space is impressive. One key lesson learned from the visit was the incredible role Canada and Calgarians played in WWI and WWII. In many ways, Canada seemed to be a bigger player on the world stage 100 years ago than it is today. I had a similar aha moment at the Glenbow last week reading about the accomplishments of Lord Beaverbrook and his influence on the economy and politics of England in the early 20th century. Another aha moment came to me when I read a telegraph and realized it was not unlike a tweet in that the text was abbreviated to just the essential words. While we always talk about how the world has changed, in some ways it is not that different. The abbreviations of a tweeter are similar to “shorthand” that was all the rage in offices in the mid 20th century. You can look through a submarine periscope and see for miles....downtown looks like it is just a few waves away. Another display that documents the hardships of life in the trenches. The science of shell making. Outside there are several tanks and amoured vehicles, unfortunately you can't climb them. The Military Museums’ visit also reminded me that Calgary should have a Museum/Attractions Pass if it truly wants to be a tourist city. Why there is not a pass that allows a tourist to pay one fee to visit not only the Military Museums and the Glenbow, but Fort Calgary, Heritage Park, Calgary Tower, Canada’s Sports Hall of Fame, TELUS Spark and the Calgary Zoo is beyond me! Calgary has an impressive line-up of museums and attractions that are under appreciated locally, provincially, nationally and internationally. We really need market Calgary as a museum/attractions destination if we want to be more than just the gateway to the Rockies in the minds of tourists. It never ceases to amaze me how a day of flaneuring will unfold. This time we were checking out the galleries on 124th Avenue (Edmonton’s Gallery District) and Brenda said, “let's wander the next block over and see what the homes are like.” We quickly found the urbanscape had changed from an almost treeless, commercial, noisy street to a calm, tree canopied street in Westmount with a mix of early 20th century homes. The homes weren’t huge mansions, but not tiny cottages either. Some had been fixed up nicely, but lots were in need of some TLC and there was one new infill. Laterthat later day, we read in Avenue Magazine, that Westmount was ranked #5 on their list of Edmonton’s Top 10 Neighbourhoods. The house that really caught our attention was the one with about six major steel sculptures on the front lawn. We knew that Edmonton had a love affair with steel sculpture, but this still seemed a bit strange. Later, just a few blocks away and back on 124th Street, we wandered into Scott Gallery where we saw a steel sculpture by Peter Hide. So we thought we’d ask what they knew about the house on 125th Street with all the steel sculptures. They knew nothing, but were intrigued and said they would check it out. Wonderful tree canopied street in Westmount, Edmonton. Fun house in Westmount, Edmonton. Front yard as an Art Park? 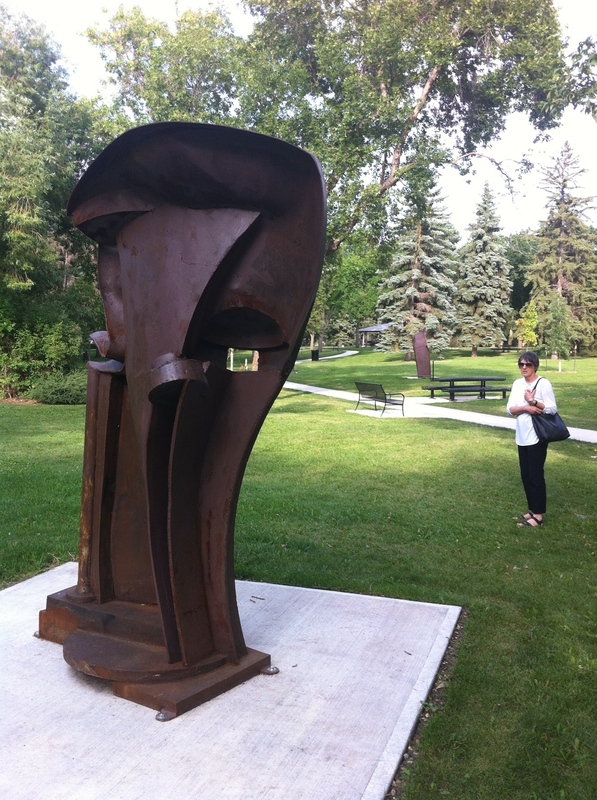 They also proceeded to tell us about Borden Park that has been recently revitalized to include several pieces of public art including several steel sculptures. Sounded interesting, but we had other plans - to meet a friend in Little Italy for lunch. The idea of checking out an art park intrigued us both, so by about 6 pm we decided we had to check it out. Also, it was kind of on the way back to Urban Escape B&B where we were staying at. The backstory to Borden Park is that it was originally called East End City Park when first opened in 1906, but renamed for Sir Robert Laird Borden, the 8th prime minister of Canada after he visited Edmonton in 1914. It was a popular park with one of the city’s first outdoor swimming pools and included a popular band shell and baseball diamonds. Folklore has it that up to 7,000 people would invade the park on sunny Sundays for picnics and other activities in the early 20th century. It was also a fairground with rides - a carousel, roller coaster and the something called “tunnel of love known as the “Old Mill.” It was also home of the first Edmonton Zoo. Fast forward to the early 21st century and an August Saturday early evening (it had been a beautiful day) and there were probably less than 50 people in the park. Yes, a few picnickers, a dog walker, a few walkers and some families at the playground. Amazing what a difference 100 years makes – gone are the rides and animals. In 2006, the City of Edmonton approved a revitalization plan for the park, which included a new uber-chic washroom, new furniture, refurbished bandshell and pathways and modern public art. The old swimming pool is still there but closed, plans are to convert the old swimming pool into a “natural swimming experience” (i.e. the water will be filtered naturally rather than using chemicals) that can converted into a skating rink in the winter. As we entered the park the first thing we encountered is this futuristic looking building that turns out to be an elaborate washroom. Oh yes, we did check out the sculptures and we were the only ones doing so. Except for two colourful pieces, they were all very modest scale, modernist abstract assemblage steel sculptures. They were all pretty static for my tastes, not very visually engaging and were robbed of any power they might have in a gallery setting, by the expanse of the park and its towering trees. Even in the smaller more confined space of the contemporary water feature area of the park the four sculptures seemed lost, no synergy with the water or each other. My favourite piece had no information on the artist or the piece; perhaps it was the newest piece and they just haven’t put up the information yet as all the other pieces were labeled. (Thanks to Allison Argy-Burgess, I found out the piece is called “Willows” and the artist is Marc Fornes.) It was a colourful, root-like form that allowed you to walk inside it. And when inside, you noticed it was full of fun Matisse-like cutout holes that sparkled in the sunlight like a kaleidascope. It had a dream-like quality to it inside and out, like something from a children’s fairy tale. 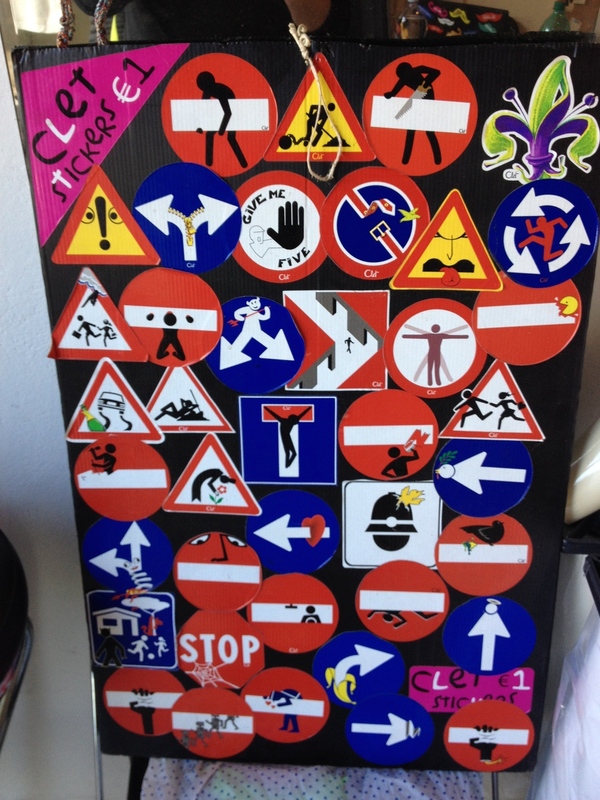 I like the playfulness of the piece and that there was some engagement of the viewer to come inside and explore it. Willows (2014) by Marc Fornes is large and bold enough to capture park visitor's imagination. Fornes invites our to go inside the sculpture and look out and up. Standing inside the sculpture there is fun interplay of light, colour and shapes. It is like getting inside a children's playground or a kaleidescope. I think the sculptures would benefit by being relocated to a smaller, open gallery-like space where they could play off of each other to create their own sense of place. As is, they are not large enough to take command of the large expanse of the park space they currently inhabit. there is also not enough diversity of materials and subject matter - 90% of the works a welded steel. I have included the label text for each piece, which I also think does little to help the public better understand and appreciate the artwork. Ace of Wands (2014) by Ken Macklin, welded steel. Ace of Wands is a highly visual work, inviting the viewer to discover complex, intriguing relationships within its structure. The curvy, or rhythmic section is interdependent upon the more angular structural element upon which it leans. The artist evokes imagery found in the mirror arcana of the Tarot. Aces signify beginnings: wands animation and enterprise. The inspiration and sculpture represent an artistic departure for the artist for the artist in the use of repetitive curves. Gaekwar of Baroda (1999) by Peter Hide, mild steel. Gaekwar of Baroda is particularly inspired by the Indian sandstone reliefs of the Bordon Collection housed at the Glenbow Museum in Calgary. Sculptor Peter Hide states, "I was attracted by the voluptuous curves of the human body played off against the massiveness and rigidity of architectural forms. I wanted to try and bring some of these qualities into steel sculpture. Wither and Tome (1993) by Clay Ellis, welded steel. Wither and Tome is one of a series of pieces produced by artist Clay Ellis in the early 1990s. It is made of mild steel with a coating produced through a simple oxidation process. Before embarking on the series, the artist traveled, within an 11-month period to Scotland, northern China, New York City, and led a workshop in Botswana. Ellis states that although he gathered many impressions in his travels, "...it was the time spent working in a remote village, on the border of the Kalahari...that shaped the work from this period. Starting a sculpture from a place where only the landscape is monumental seemed right...and familiar." We started the day out a plan to check out Edmonton’s Downtown Farmers’ Market and meet a friend for lunch. Who knew we’d end up in the east end of town exploring a park that was no more than a swamp just over a 100 years ago. For awhile now I have been advocating that public art would better serve the public good if it was installed in its own art park where it could be curated to capitalize on the synergy between the pieces, rather than trying to compete with surrounding architecture and clutter of streetscape designs. Borden Park is an attempt at doing so, but unfortunately missed the opportunity to truly create an art park that captures the public’s imagination – young and old, bohemian and bourgeoisie. I understand the plan is to have 11 human scale, temporary sculptures dotting the park’s 23-hectars. I seriously doubt this will be sufficient to attract the public to venture to Borden Park to see the art.